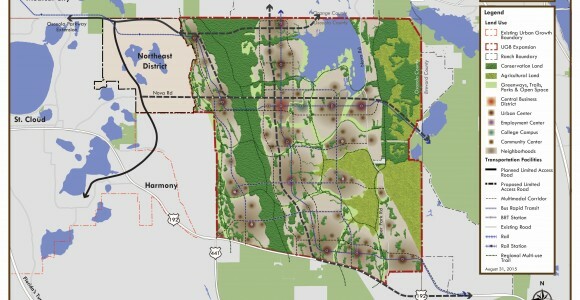 The Department of Economic Opportunity (DEO), Florida’s state land planning agency, has given final approval to the 133,000-acre North Ranch Master Plan in Osceola County, making it the largest land use plan ever approved in the State of Florida and one of the largest ever in the United States. Hopping Green & Sams (HGS) attorneys David Powell and Gary Hunter helped lead the multi-disciplinary team assembled by client Farmland Reserve, Inc., d/b/a/ Deseret Ranches of Florida, in preparing and the plan and working for its approval since 2011. The plan received approval from the Osceola County Board of County Commissioners on September 21, 2015, and DEO approval on October 30, 2015. It covers a major portion of Deseret’s 250,000-acre North Ranch in Osceola, Orange, and Brevard counties and is located adjacent to a 19,000-acre portion of the ranch in Osceola that was planned for mixed-use development in 2010 with leadership from HGS lawyers. In its final form, the North Ranch Master Plan incorporates numerous changes recommended by environmental stakeholders in six meetings with County staff and the landowner between November 2014 and September 2015, as well as numerous changes recommended by DEO and other state and regional review agencies. The plan is based on a projected 490,000 residents in the Osceola County portion of the North Ranch by 2080 in mixed-use centers served by both roads and fixed-rail transit. The plan will set aside 42 percent of the planning area for permanent preservation as Conservation or Agricultural lands with another 15 percent identified for Greenways, Trails, Parks and Open Space. The area of urban development and rights-of-way constitutes 38 percent of the planning area. The existing Taylor Creek Reservoir constitutes another 5 percent of the planning area. The plan will expand Osceola’s Urban Growth Boundary to include the planning area and designate it as a mixed use district under the county’s comprehensive plan. The plan uses Osceola’s seven mixed-use place types to create 16 centers linked by a multimodal transportation system. The centers will have a minimum residential density of 5 units/acre. Major centers are planned for densities of at least 12 units/acre in order to facilitate transit as an alternative to private motor vehicles. The plan sets aside a minimum 320 acres in the central business district for a new higher-education campus next to a planned research park. HGS attorneys Richard Brightman, Frank Matthews and Eric Olsen also participated in preparation of the plan and worked with agencies and stakeholders to identify and resolve issues.